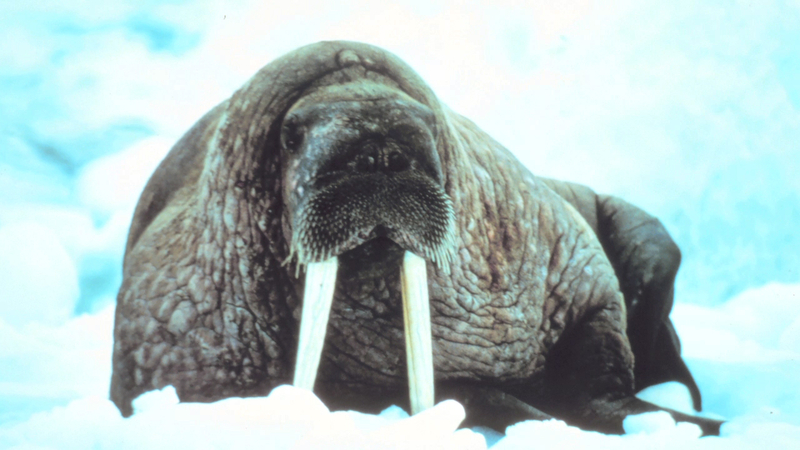 The Arctic Ocean and subarctic seas are home to a hefty fellow: the walrus. These beasts use sea ice for resting and giving birth. And not any ice will suffice; it has to be thick enough to support their weight, which can reach up to 4000 pounds. Their blubber serves as a layer of insulation in the cold marine environment and helps them store energy. Their flippers are hairless. The skin on them is thick and rough, providing traction on land and ice. The Latin name for the walrus translates as “tooth-walking sea horse.” You can understand why. Walruses use their long ivory tusks to haul their heavy bodies up onto the ice, to forage for food, and to defend against predators. The main role of the tusks, however, is a social one. Walruses use them in their herd for dominance and mating displays. Guess they gotta look cool in this type of climate. And that’s life with the ice for walruses. El Océano Ártico y mares sub árticos son hogar de un fornido amigo: La Morsa. Estos animales usan el hielo marino para descansar y dar a luz. Y no cualquier hielo, sino lo suficientemente grueso como para soportar su peso, que puede alcanzar hasta 1,800 kilogramos. Su grasa le sirve como capa de aislamiento contra el medio marino frío y le ayuda a almacenar energía. Sus aletas no tienen pelo. Su piel es gruesa y rugosa, para proporcionarle tracción en tierra y hielo. El nombre en latín de la morsa se ​​traduce como "caballo marino dentado caminante”. Podrás entender por qué. Las morsas usan sus largos colmillos de marfil para transportar sus pesados cuerpos ​​sobre el hielo para buscar comida, y para defenderse de los depredadores. Sin embargo el papel principal de los colmillos, es social. Las morsas los utilizan en sus manadas en muestras de dominancia y apareamiento. Supongo que tienen que verse bien en este tipo de clima. Y esa es la vida en el hielo para las morsas. The word walrus is latin for "tooth-walking sea horse." Walrus tusks can grow up to 3 feet long and are actually teeth. Walruses are listed as an endangered species.